I would be so happy to have this sweet lamp softly flickering and swaying in my living room or bedroom, like an urban garden or landscape. I adore the simple beauty behind Japanese products, don't you? "The light flickering silently, the body swaying gracefully; it evokes a sense of fragility. 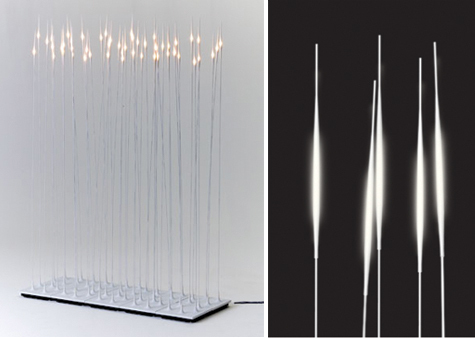 METAPHYS Susuki is a floor lamp inspired by the Japanese silver grass, susuki. This innovative and unsusual light will bring a new and balanced atmosphere into a space." oooh! where can you buy this in the US?